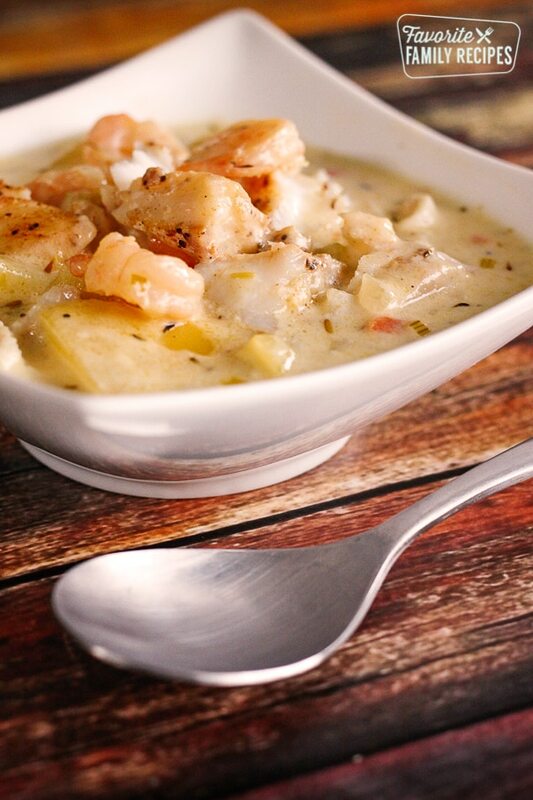 With big chunks of seasoned fish and potatoes, this is hands down the best Seafood Chowder recipe ever. It is thick, creamy, and full of flavor. This is hands-down my favorite seafood chowder recipe (including seafood chowders that I have had in restaurants). The best thing about it is that you can use what you have on hand! Last time we made this we stirred in some fresh lobster and oh. my. gosh. it was delicious. This could be considered a Fish Chowder Recipe, but Crab Meat would be a great addition too. You can also add other ingredients like corn or bacon if you would like (I like the flavor of this JUST how it is but if you want to add more, please do)! This recipe is pretty similar to our Clam Chowder recipe, except it is easier and a little more versatile. Sometimes I saute the fish and shrimp in some butter to get a little crust around each piece, which makes it extra delicious but it adds another step. Do what you like– you really can’t go wrong! In a large dutch oven or stock pot, melt butter and add celery, onions, leeks and garlic. When vegetables have softened, add chicken broth, clam juice, potatoes, carrots, black pepper, salt, thyme, bay leaves, and Tabasco sauce. Bring to a boil and reduce heat so medium-low to simmer. Cook for about 8-10 minutes or until potatoes are almost fork-tender. Season shrimp and cod with Old Bay seasoning. Add shrimp and cod to the stock-pot and simmer another 7-8 minutes or until fish flakes easily and shrimp turns pink. Add half and half. Combine flour and milk until flour is dissolved and slowly stir into the chowder until you reach your desired thickness (you may not need all of it). Stir until thickened and season with salt and pepper to taste. Remove bay leaves and serve! A nice soup recipe. Thank you. How much Old Bay do you like to use? Thanks. Approximately a teaspoon, but usually I just sprinkle it on until it looks like it is well seasoned. Does that make sense? Could you use crawfish tails or catfish filets instead of the cod? Absolutely! You can add whatever seafood that you think would go well! How many cups or servings does this make? It looks like quite a lot. Hubby is allergic to clams. Is there anything I can substitute for the clam juice? I am trying this tonight with shrimp and scallops. Also have to make a few changes due to food allergies. Can’t wait to try this! You can use any kind of seafood or all-purpose seasoning salt if you can’t find “Old Bay” brand. Hope this helps! In your ingredients list, you mention the quantity “c” . I am not familiar with it. Is it a cup? Thank you. Yes, c = cup Hope that helps! This chowder was really good! I followed the recipe, except left out the leek. My young kids even liked it! Will definitely make again soon! Easy recipe to follow and the chowder turned out great!! Thank you. I am making this tomorrow morning around 10 a.m. PST Friday. Your recipe is very vague regarding potatoes. Red come in multiple sizes. Can’t you just say cups, small medium large potatoes?
. Diced, what size is this? Finely diced, same thing. Please reply to my email address, it is very difficult and time-consuming to come back to this recipe. Thank you for your comment, as we get hundreds of comments and e-mails it is extremely difficult to respond to each one in less than 48 hours. We try to answer emails/comments as quickly as possible and answer them in the order that we receive them. For the potatoes, you can dice them any size you would like– we like them to be about 1/2″ dices. It should be about 4-5 cups of diced potatoes. Hope this helps! Hi Ddra– I am sorry we weren’t able to respond to this in time. Next time you have an urgent question– please e-mail (see “contact”) us as sometimes we are able to respond to e-mails more quickly than comments. We are getting SO many comments right now because of the holidays and we must answer them in the order received. Hope the chowder turned out ok for you! This should make about 8-12 servings, depending on if you serve as a main dish or a side dish. Hope this helps! I’m making this chowder for a large group as a first course so I’d like to make it a day ahead. Does it work well made a day before serving? Hi Janet– it tastes best fresh, but you should be able to make it a day ahead and re-heat. Hope this helps! Does anybody know the calorie count for this dish? Thanks! Yes, definitely, if you like it thicker you can add more flour or some cornstarch! Made it for diner toning using frozen sea food mix-shrimp, scallops, clams, calamari, crab, and lobster except our 5 qt dutch oven couldn’t hold it all so we shorted 1 quart of half and half and thickened the mixture with baking soda. Sprinkled crispy bacon pieces on top too. It was delicious, we’ll be looking forward to eating this as a leftovers for the next couple of meals. Oh yum! That sounds delicious! Love the idea of using a big seafood mix. Thank you for sharing! How do you thicken with baking soda? The most common use of baking soda is for leavening, when combined with acidic ingredients. It also has some uses in browning meats and in certain candy recipes. To use enough to thicken, it would taste awful! Would substituting seafood broth (or stock) instead of chicken broth be okay or would it be too salty? And still ok to add the clam juice? Also, is the clam juice from the can of clams the same as the bottle of clam juice (w/out any clams)? I haven’t used seafood broth before, so I can’t speak to how it would change the recipe. Clam juice is different than what comes out of the can – it actually contains extract of clams.